Blue and black are very popular colors for attire. It is a cool combination when color blocking as well. It is perfectly fine to throw another lighter shade of blue in the mix for a pop of the same color to make the color blocking system stand out even more. For more of a contrast, add accessories and nail color which are various shades of one of your main colors. In this case the color blue or even green is a good alternative. 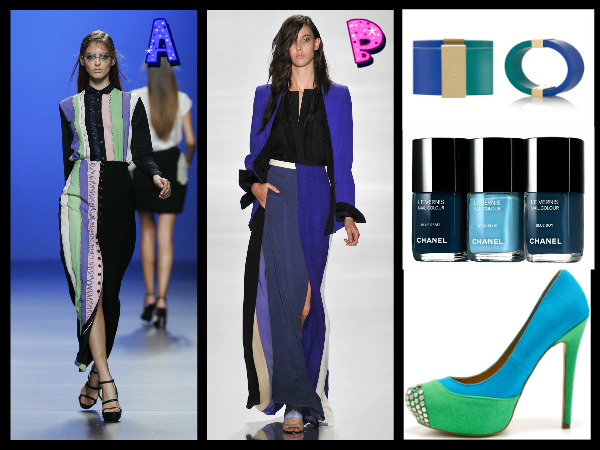 Which of these color blocking styles do you like best? Style A (Martin Lamothe) or Style B (J. Mendel)? I like A, and i LOVE those shoes!